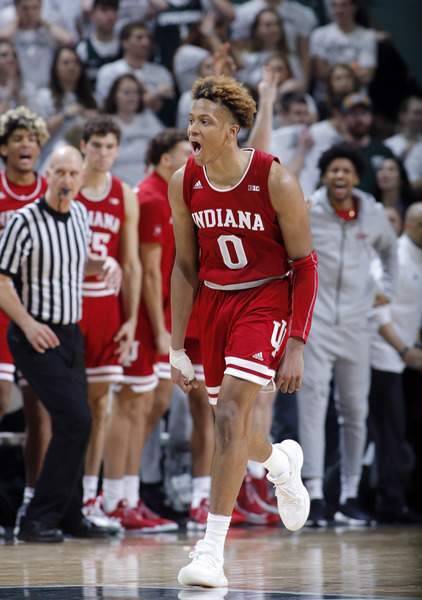 Associated Press Indiana's Romeo Langford celebrates after hitting a go-ahead 3-pointer against Michigan State during overtime Saturday. Langford had a team-high 19 points as the Hoosiers snapped a seven-game losing streak. EAST LANSING, Mich. – It's difficult to imagine a more unlikely place for Indiana to end a long losing streak than the Breslin Center. Michigan State's arena has been a house of horrors for the Hoosiers. They'd only won there once in nearly 30 years. In one of the most surprising results of the Big Ten season, the Hoosiers broke their seven-game losing streak with a thrilling 79-75 overtime victory Saturday, getting 19 points from Romeo Langford and 13 points and 10 rebounds from Justin Smith in front of 14,797 stunned fans. The win against the No. 6 Spartans (18-4, 9-2 Big Ten) was the first over a top 10 team in Archie Miller's two years as head coach. Indiana (13-9, 4-7) pulled out its biggest win of the season without its emotional leader. Juwan Morgan brought significant energy in the early going, grabbing six rebounds in 13 minutes, but left the game late in the first half with an injury to the same shoulder on which he has previously had surgery. He did not return, and Miller did not have an update after the game. Without Morgan, junior De'Ron Davis filled the void in the middle. Davis had not played in two weeks because of an ankle injury but returned to provide a season-high 25 minutes off the bench. He scored 12 points, grabbed six rebounds, dished off four assists and banged down low with the Spartans' Nick Ward, one of the strongest players in the Big Ten. It was Davis who hit two free throws with seconds left in overtime to ice the victory. From the opening tip, it was obvious this the Hoosiers were a changed team. Indiana had more energy than it had had all season and was constantly on the floor diving for loose balls. The extra intensity showed up the most on the boards, where the Hoosiers outrebounded Michigan State, one of the best rebounding teams in the country, 48-40. Smith led all players with his 10 rebounds and added three blocks, including a key rejection of the Spartans' Cassius Winston with 4 seconds to go in overtime that kept Indiana in front by two. Davis grabbed the rebound off the block to set up his clinching free throws. Winston had 26 points, eight rebounds, seven assists and three steals. The Spartans' Kenny Goins had eight blocks. The game was close the whole way, with neither team leading by more than six points. Indiana had a chance to win at the end of regulation, but Langford missed a 3-pointer badly at the buzzer. The freshman, who went 6 of 18 from the field, bounced back with a huge 3 at the end of the shot clock early in overtime to put the Hoosiers in front 71-70. Indiana never trailed again. Langford's big 3-pointer was one of 10 Indiana hit in the game on 20 attempts, a world apart from the team that had hit just 19 percent from deep in the previous six games. It was only one of the myriad ways Indiana shed what had ailed it during its losing streak. “Without question tonight we looked like a different team,” Miller said.